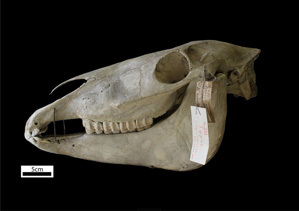 Mammalian Collection of the Zoological Institute of Russian Academy of Sciences currently contains more than 140 000 specimens (skulls, skins, and bodies in alcohol), some part of which (about 500 units) are permanently exhibited in the Zoological Museum. Most parts of it are stored at the Fauna History and Systematic and Phylogeny Departments of the Laboratory of Theriology, and are available to scientists only. Species from different continents and the World Ocean, in addition to «Mammoth Fauna», are the basis of the Collection. 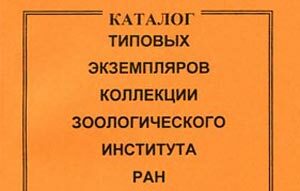 Due to the works of Dr. Alexander Averianov during the last two decades the Collection is replenished by Neogenic, Paleogenic and Late Mesozoic mammals (Docodonta, Zalambdalestoidea, Ctenodactiloidea, etc.) 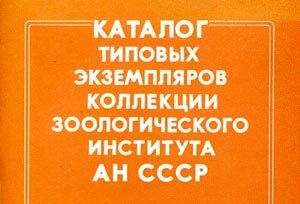 discovered on the territory of Russia and adjacent countries. 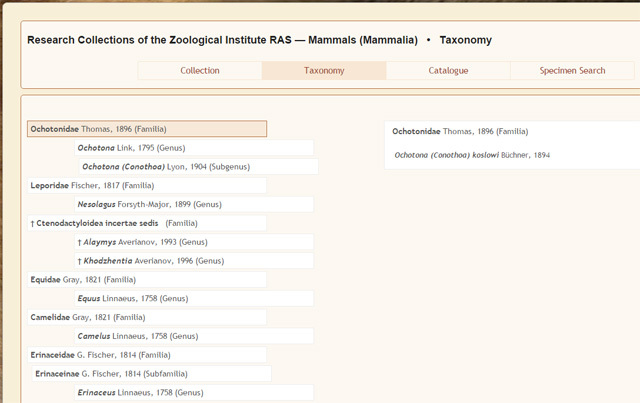 Digitizing of research collections of the Zoological Institute is performed within the framework of RFBR #15-29-02457 (competition of oriented basic research on important interdisciplinary themes 2015) «The collections of the Zoological Institute as an important tool and information basis of fundamental biological research» (project leader Dr. Ananjeva N.B. ).